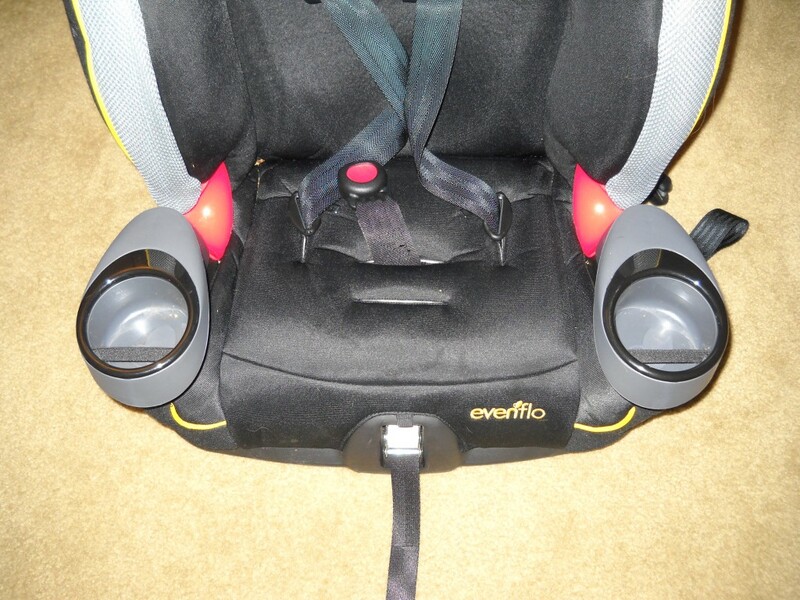 The Evenflo SecureKid 300 harness booster seat is an easy-to-use lightweight seat that can grow with your child. I purchased this seat in August 2013 for my 2-year-old daughter. While most 2-year-olds are still too small for a booster, she is already over 40 pounds and taller than 40 inches—the size of many 4-year-olds. My 2 1/2 –year-old sitting in the Evenflo SecureKid 300. Believe me, she really is a happy child despite what her face says. I settled on this particular harnessed booster because of its high harness weight limit—65 pounds. It is also relatively narrow, measuring only 19” wide. Another major factor in my decision was the price. I was able to buy this for less than $100. All car seats and boosters have to meet minimum federal safety standards, so purchasing a less expensive option does not sacrifice safety. 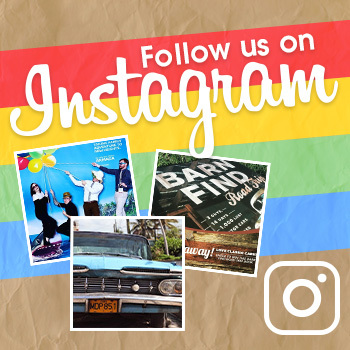 The Evenflo SecureKid 300 is even rated as a Best Bet by the Insurance Institute for Highway Safety. What I really like about this seat is the fact that my daughter can climb into it herself, which she loves. She even helps buckle herself in. I do the buckle and she does the chest clip. I also love, love, love the latch system on this seat. 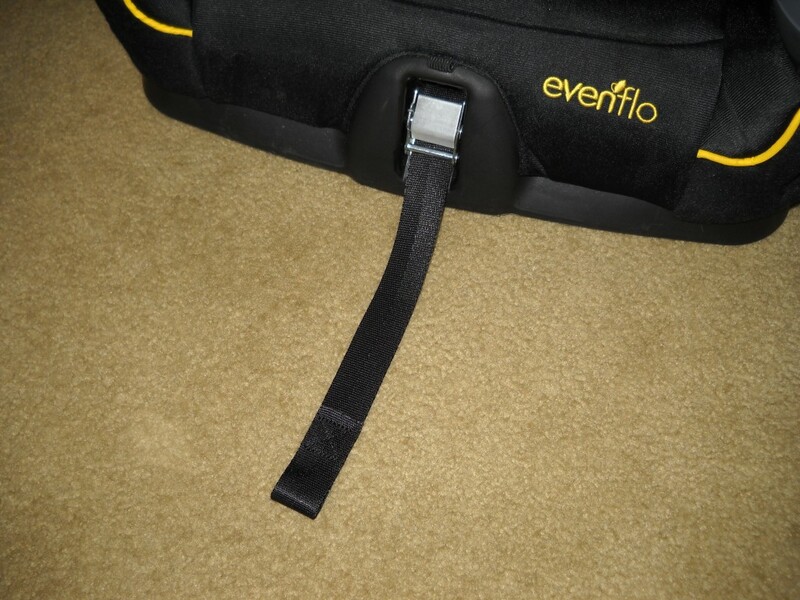 Evenflo calls it the SureLatch Connector system. 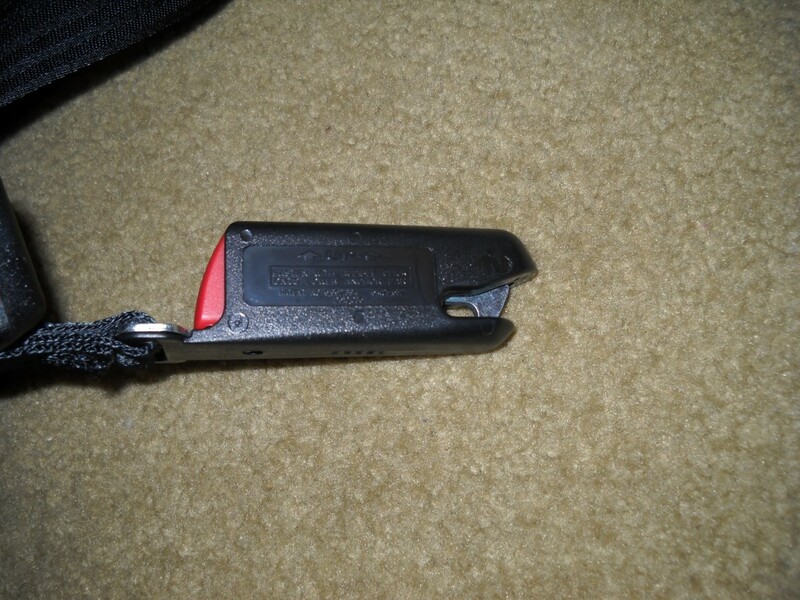 All you have to do is push the clip onto the latch in your car and it automatically locks in place. And to unhook it, just press the red button and pull. This is so much easier than the standard hooks. Another bonus is the two cup holders. These have an elastic band in them to help hold the cups in place. Elastic bands to hold your child’s cup in place in the Evenflo SecureKid 300. The Evenflo SecureKid 300 is highly adjustable. It has four top harness positions, an adjustable headrest, and the crotch buckle has two available positions, as well. After your child weighs 65 pounds, you can continue to use the seat until they weigh 110 pounds or are 57 inches tall. Just remove the harness straps and use it as a belt-positioning booster. I have not used this seat in this way yet; however, I like how the red highlights on the seat show you where the belt is supposed to go. Also, based on what I can see, it seems the seat is designed to keep the belt securely in place. My least favorite thing about this seat is that the harness straps are a bit too close together at the neck. My daughter frequently says it hurts. I did buy strap covers (not in the pictures) and that seems to help. Another issue is the front adjusting strap is a bit short. We still have two harness positions to go and there isn’t much slack left. This is how much slack is left when the straps are adjusted to fit my daughter. Based on my family’s budget and car requirements, this was the best seat option for us. While the Evenflo SecureKid 300 does have some minor flaws, I would buy it again, and I would recommend it to friends and family. 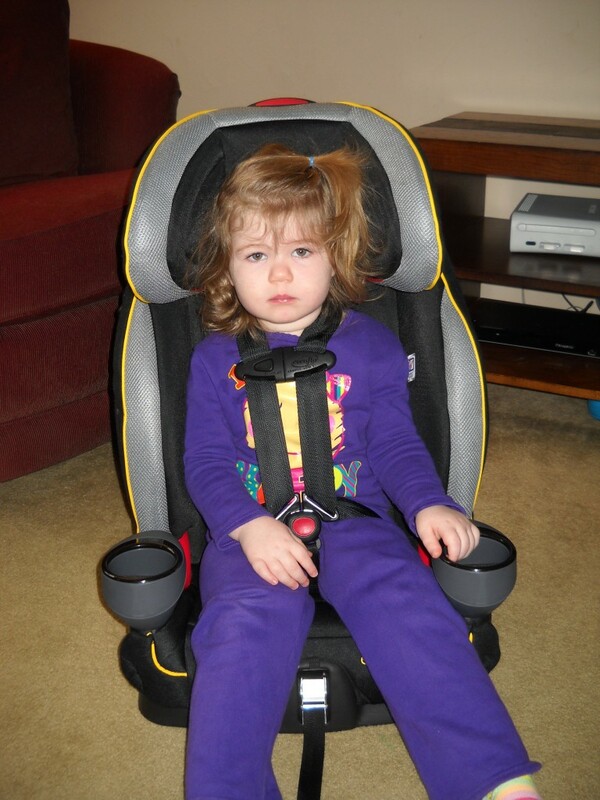 If you need tips on how to correctly install a booster or car seat, read this all-inclusive guide to car seat safety. 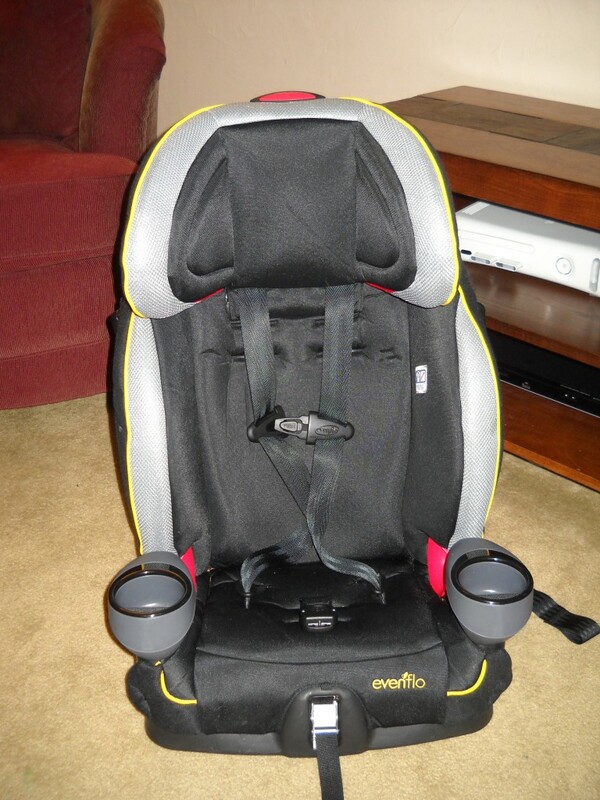 You can also read my reviews for the Graco My Ride 65 and 70 and the Evenflo Tribute.